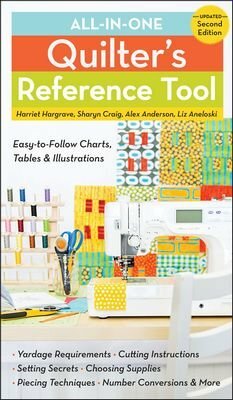 This 2nd Edition All in One book gives fast answers to dozens of quilting questions to include: Yardage requirements, Cutting instruction, Setting Secrets, Choosing Supplies, Piecing Techniques number conversions and more. How big is a twin size quilt? How many squares can you cut from the amount of fabric you have? What's the best way to sew a mitered border? How do you make bias binding? It has been updated to include more answers, more techniques, more quilt settings, and more blocks then ever before. Comes in a handy take anywhere size. 72 page book,color, wire binding measures 5.25"x9"